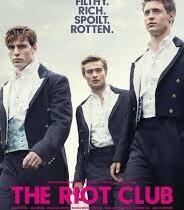 I thought I’d stumbled into the wrong film for a few minutes after The Riot Club started. On-screen were a group of Oxford Englishmen in 18th century wigs; one particularly randy gent was having his way with scantily-clad ladies. He seemed to be a cross between Lord Byron and Tom Hulce‘s Amadeus. There was a lot of feasting and crystal smashing. But no, these badly-behaved lords were just the progenitors of modern badly-behaved lords, whom we get to know in the film very soon. Then as now it seems, members of Oxford’s (fictional) ultra-elite Riot Club are as spectacularly privileged as they are horrifically depraved. Nowhere in Oxford’s college promotional material will anxious parents read about anything like this. Fast forward to 2014: Miles (Max Irons) is a new man on the Oxford campus. He’s good-looking, relaxed and affable, and he seems to be the only incoming freshman who isn’t a disgusting, cleverer-than-thou snob. At a rowdy party he meets Lauren (Holliday Grainger), sensible and lovely graduate of a not-so-posh public school who seems to actually be interested in studying. Meanwhile, fellow fresher Alistair (Sam Claflin), brutally handsome with hooded eyes, is arrogant even for an Oxonian. He’s the kind of fellow who lectures thugs on their choice of words as they’re mugging him at the ATM. Miles and Alistair, temperamentally polar opposites, are both recruited into the Riot Club, a posse of rich boys with hereditary titles whose goal is to live life to the fullest, just because they can. This means eating to excess, playing intellectual drinking games, belittling common people, and trashing other people’s property. When they’re finished with their juvenile rituals, they make it all right by paying off people whose restaurants and rooms they’ve destroyed. The Riot Club’s behavior is so outlandish that they’ve got themselves banned from dining establishments for miles around Oxford. Despite Miles’ (and Lauren’s) misgivings, he decides that the honor of being selected for membership is too good to pass up. And since Alistair’s older brother was a legendary past president of the Club, he sees his initiation as only his due. But when the Club stages its first debauched dinner to welcome its new members, things spiral out of control. What ensues is a situation that shocks even the Rioters. Based on her successful stage play Posh, Laura Ward’s script portrays a class of Englishmen who are straddling the past and the present, but haven’t yet got the memo about the values of democracy or David Cameron’s austerity initiatives. The film points out that these scummy scions of noble houses are future captains of Industry, Finance and Law. It’s a sobering thought. Director Lone Scherfig is a Dane who specializes in making films that capture the essence of British society (An Education, One Day). The actors and sets are all handsome and top-notch.